The problems of using the expander–generator unit (EGU) to generate refrigeration, along with electricity were considered. It is shown that, on the level of the temperatures of refrigeration flows using the EGU, one can provide the refrigeration supply of the different consumers: ventilation and air conditioning plants and industrial refrigerators and freezers. The analysis of influence of process parameters on the cooling power of the EGU, which depends on the parameters of the gas expansion process in the expander and temperatures of cooled environment, was carried out. The schematic diagram of refrigeration generation plant based on EGU is presented. 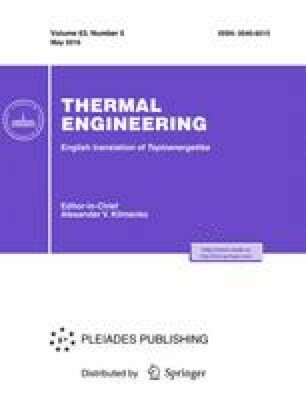 The features and advantages of EGU to generate refrigeration compared with thermotransformer of steam compressive and absorption types were shown, namely: there is no need to use the energy generated by burning fuel to operate the EGU; beneficial use of the heat delivered to gas from the flow being cooled in equipment operating on gas; energy production along with refrigeration generation, which makes it possible to create, using EGU, the trigeneration plants without using the energy power equipment. It is shown that the level of the temperatures of refrigeration flows, which can be obtained by using the EGU on existing technological decompression stations of the transported gas, allows providing the refrigeration supply of various consumers. The information that the refrigeration capacity of an expander–generator unit not only depends on the parameters of the process of expansion of gas flowing in the expander (flow rate, temperatures and pressures at the inlet and outlet) but it is also determined by the temperature needed for a consumer and the initial temperature of the flow of the refrigeration–carrier being cooled. The conclusion was made that the expander–generator units can be used to create trigeneration plants both at major power plants and at small energy. Original Russian Text © A.V. Klimenko, V.S. Agababov, A.V. Koryagin, Yu.O. Baidakova, 2016, published in Teploenergetika.